Rainy Day with Thunder and Lightning, a photo by aghrivaine on Flickr. Rain is fairly rare here. And a proper thunderstorm with lightning even more rare. 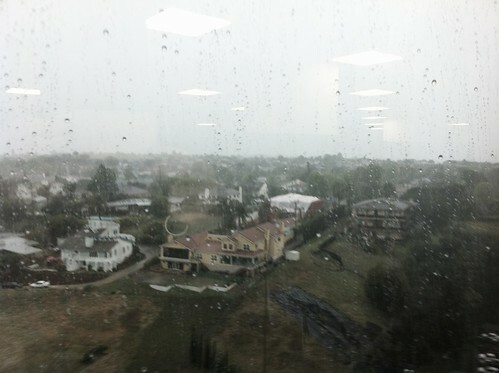 Here I am, on Friday the 13th, on the 13th floor - in a lightning storm. Am I tempting fate for a third lightning strike? Somewhere, Blink is barking his head off, he doesn't like thunder one little bit. In the mean time, this is a pretty good spot to enjoy the show - not quite as great as the firewatch tower in Valley Forge Park. But what is? I would miss thunderstorms. Can't decide if the lack of snow and regular access to beaches would be worth the trade.